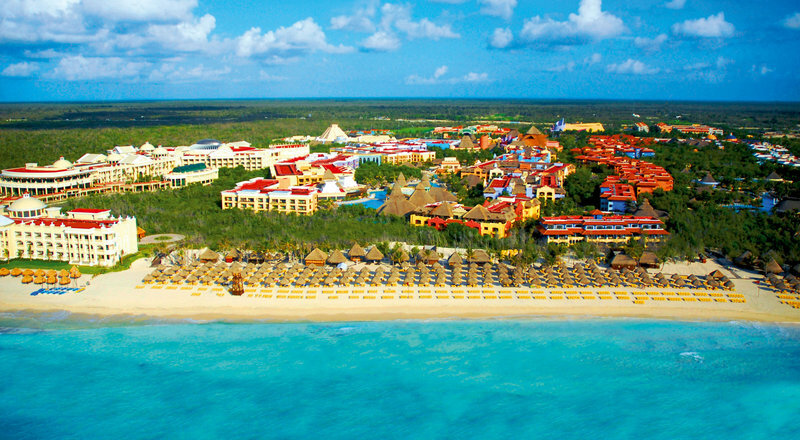 The IBEROSTAR Paraiso Lindo (All Inclusive 24hr) property is a 5-star resort located on the Riviera Maya. It is the winner of the 2013 Green Globe Award and was named the #5 hotel in TripAdvisor’s Top 25 Hotels for Families in Mexico. Guests enjoy exchange privileges with IBEROSTAR Paraiso del Mar and IBEROSTAR Paraiso Beach. This property has 446 guest rooms made up of a variety of room categories. Each room comes equipped with a safe and minibar. Room service is available 24 hours and free WiFi is available in the rooms and lobby. There are many dining options available including 4 specialty restaurants, 1 buffet restaurant, and 5 bars. The al a carte and buffet restaurants feature a mix of traditional Mexican as well as international cuisines including Mediterranean, French, Southern USA, and Steakhouse. If you would like to be active while on vacation, this property offers many options. Activities include tennis, archery, beach soccer, beach volleyball, ping pong, petanque, horseshoes, bicycle tours, dance classes, yoga classes, boot camp classes, Zumba, Pilates & stretching, TRX, and strength training. Water activities such as water polo, aqua aerobics, water volleyball, water basketball, jet-skies, catamarans, parasailing, kayaking, snorkeling, PADI diving certifications, and windsurfing are also available. Additionally, an 18-Hole professional course is available for a round of golf. Stay relaxed at this resort with a trip to SPA Sensations which offers a full range of spa services. Such services include massages, facials, and therapies. Beachfront massages are also available. There are many entertainment options for both children and adults at this property. Kids stay entertained by use of the kid’s pool, wave pool, Water Park, kid’s club, archery, mini-disco, carousel, DJ lessons, snorkeling, water Olympics, treasure hunts, talent shows, magic shows, teen’s club, and more. A dedicated team of StarFriends help organize and facilitate activities for kids and families. For adults, options include shopping, dance instruction, cooking classes, bar lessons, pool games, theater shows, karaoke, the galaxy disco, live music, and the casino. Activities are also available for families to enjoy together.